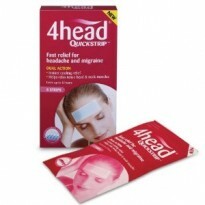 4head QuickStrip is an advanced frigorific hydro-gel patch, specially formulated to provide instant cooling relief from the pain of migraine and severe headache at the point of pain, and to help relax tense head and neck muscles. - Fast, dual action relief for whenever migraine or severe headache strike. 1. Its advanced hydro-gel strip provides evaporative cooling relief from migraine and severe headache, at the point of pain. 2. It also helps to relax tense muscles in the head and neck. 4head QuickStrip works without refrigeration and a single strip can work for up to 6 hours. 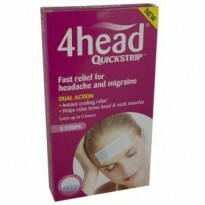 4head QuickStrip is used by simply adhering the strip to your forehead, temples or the back of your neck. The strips can be easily cut to size and there is no need to refrigerate them. QuickStrip can be used whenever you need cooling migraine and severe headache relief, and is not subject to the same dosing restrictions associated with aspirin, NSAIDs (e.g. ibuprofen) or paracetamol. 4head QuickStrip is suitable for adults, the elderly and children over 12 years old.